I am starting work on this Battaglin I just picked up and have a few questions/opinions to ask. Tires; I am thinking of putting red tires with tan side walls on this bike, any other (read cheaper) options besides these Veloflex ? Cables / tape ; White tape red cables , or should I stick with white cables? Saddle; There's already a white Regal on it ! Brake pads ; I think Campagnolo reinstated the Delta pads in their product line but the ones I see for sale go for $40 a set + shipping. Are there any other brand making them. Paint ; Columbus decal says it’s a repaint, the paint looks very original though, could this be a factory job? I doubt you'll find many other options for red with tan sidewalls. But those Paves are super good clinchers in any case and well worth the price. That's what I'm thinking. I have a set of yellow Paves from when PBK had them for $27. They are nearly impossible to mount the first time , are very slippery and get flats easily but they look fantastic and roll fast , so I might just go for a pair . I'm pretty much done with the bike but need opinions on those yellow Paves ( I already had them) . Definitely not an obvious color choice but I don't think it looks bad. Are they too much? I can put the old tires back on or some black / red vittoria tires. They are nearly impossible to mount the first time. Truer words were never written (though I find them plenty grippy and haven't had flat issues). I borrow some of my wife's blood pressure medication before trying to get them onto rims. i think it looks awesome - if i was going to build up a bike with that generation of campy i would want it to look just like that. Last edited by KonaBuyer; 07-20-09 at 02:20 PM. Last edited by jet sanchEz; 07-20-09 at 02:50 PM. Here is mine. 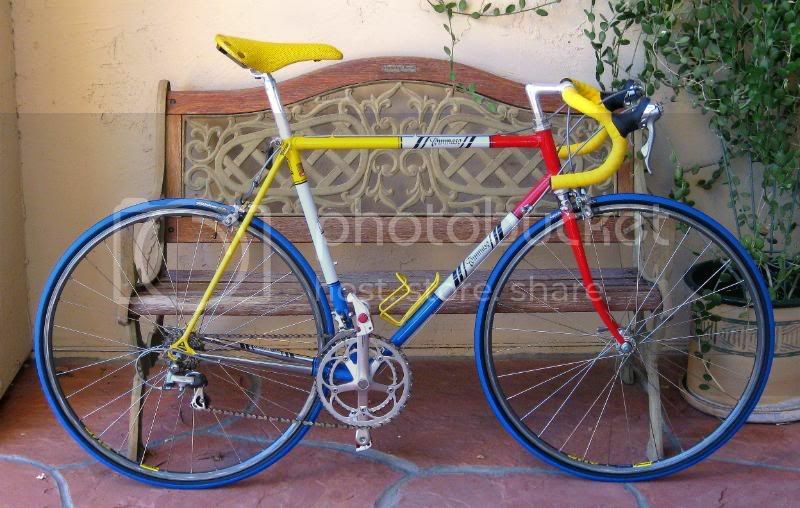 It looks to be the same bike but made of Columbus CroMor tubing and a mix of 105/600 and some Campy bits. It rides like a demon, I love it and the bike never fails to garner many compliments....I just need a better wall to take some shots against. If I hadn't already checked for helicoidal reinforcementsin my frame to make sure it is SLX I'd think its the same frame ! Personally, I think the yellow is over the top. I love the sno-cone Battaglins, but the yellow for me pushes the whole package from 'dated' to 'Chuck-E-Cheez'. I'd throw on some black racers with a stripe of red or white down the center of the tire. Don't get me wrong though - great great bike. Yep. These are pretty rare bikes I guess, I have never seen another one and I was actively looking for a Battaglin for quite awhile before I got lucky with this one---it was mis-listed on Kijiji and I got it for a few dollars less than yours but wow, it was very very neglected and needed a lot of love before it was road-worthy. I guess you already know this but the colour scheme is from Steve Roche's triple-winning Battaglin and I guess the company figured it would be smart to copy it for all of their models that year. Just put a thread up about mine and really trying to figure out what kind of frame it is. Can you check it out my thread and see if you can spot any differences? Well, most pictures in your thread have disappeared but yours probably doesn't have the number hanger under the top tube for what it's worth. In my research I saw several bikes like this one with diffrent levels of tubing and components. Pic's should be back up (I messed up by moving them on the server) !